I’ve spent a lot of time daydreaming about pizza lately. Crisp, thin crust topped with zesty tomato sauce and coated with amazing cheese… Yeah. I just can’t stop. I make lots and lots of pizzas with the tot, but I’m really trying to find ways to cut the calories. With Easover behind us, we still have a few boxes of matzo hanging around, and they’re going to be there for next year’s Easover unless something is done with them. Pizza sauce is a seriously tasty thing. It can be chunky or smooth, salty or sweet, tangy or spicy-hot. All I know is that I didn’t have any in the fridge when I had the brilliant idea of using a piece of matzo as a base for my super-low calorie pizza. I did have an old can of tomatoes in the pantry, which wasn’t very appealing. But, with a bit of love, that can of tomatoes turned into something seriously flavorful, and I had total matzo pizza success. This sauce is a snap to make. Simply open the can of tomatoes and strain away any liquid. You want to use un-seasoned canned tomatoes (I also used organic). Put those tomatoes in the blender with the rest of the ingredients and blend. If you like your sauce chunky, blend for just a few pulses. But, if you prefer things nice and smooth, blend for as long as you like. If you’ve got Worcestershire sauce hanging out in your pantry, don’t shy away from adding a few drops. This adds a lovely smoky flavor and just a bit of an earthy saltiness, which makes the tomato sauce even better. 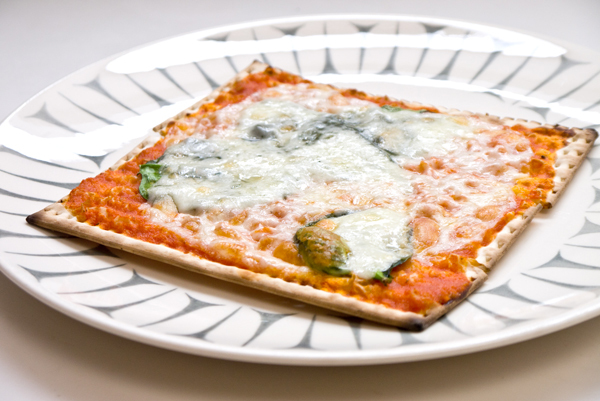 To make your own mini-matzo pizzas, preheat your oven to 450 F. Place a single piece of matzo on a sheet pan and then coat with a few big spoonfuls of that fresh pizza sauce. Add your favorite pizza toppings, a sprinkling of cheese, and then pop in the oven until the top is bubbling. oh yes Yumm I am making that!